After the previous week’s successful pop-up booth, YIH Room 4 saw a number of guests visiting NUSTM for the first time. VPM Christina opened the meeting by paying tribute to the late Mr Lee Kuan Yew with a minute of silence and reflecting on her leadership journey in NUSTM. 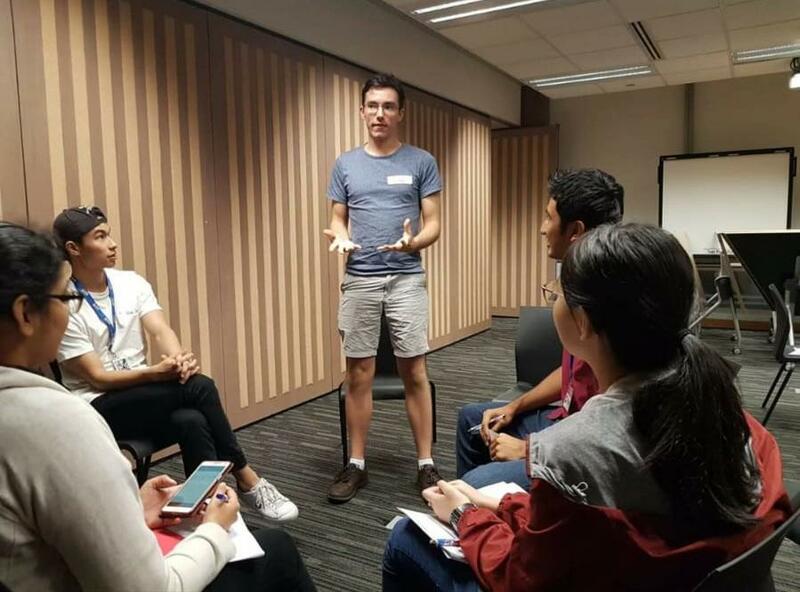 First-time Table Topics Master Ryan Leong started with an interesting series of hypothetical scenarios. Guest Seran was given the choice of living in either Antarctica or the Sahara Desert for the rest of his life. He entertained the room with his explanation that he would choose Antarctica, due to his fondness for cold weather, having lived in tropical climates for most of his life, and his penchant for the cute penguins there. Next up was another guest, Alvin, who had the ability to rewind to one moment in time. He chose to travel back into the 1950s to see the nation building of Singapore after reading up about different accounts of Singapore history due to the passing of Mr Lee Kuan Yew. The third Table Topics speaker was Kang Rui. He had the option of going for a holiday to any destination, and he chose one that is off the beaten track – Costa Rica. As zoologist Kang Rui claimed, he is not a city person and he prefers nature, which Costa Rica has an abundance of. The second part of the meeting, the prepared speeches, opened with A Glimpse into Yanping’s Life. In her emotional Project 1: The Ice Breaker speech, she spoke about her hobby of baking, and her initial failed attempts at baking. After Yanping was Weizhe, who kept the room in fits of laughter as he spoke about His Life Story on how he picked up Tamil in secondary school due to the conducive environment there and sparked his interest in learning languages. The third speaker, Cynthia, recalled her culture shock when she first moved to Singapore from nearby Indonesia to study: students here discuss their homework before class, ‘discussing answers’ during examinations rarely occur, the streets are clean, and people walking for long distances without feeling tired. The audience then gave Jun Han 5 More Minutes of their attention to listen to his persuasive speech on the importance of encouragement, in terms of his Himalayan trek, marathons and Mr Lee’s passing. Next, Kang Rui reminded the room to Sleep to Remember and Remember to Sleep, as he informed us on the relationship between sleep and memory. He ended off with two tips to boost memory: sleep three hours after studying and staggered studying. Lastly, Jackie informed us how to be In The Zone, or being comfortable on stage. CMI – Take Charge of the stage, have a Motive, and Immerse yourself at every opportunity. Guest Seran won the Best Table Topics Speaker with his humourous attempt, the Best Speaker award went to the Tamil-speaking Weizhe, and the Best Evaluator went to Wekie with his Wekie’s Words of Wisdom. Great friendship made during Club meetings! The tabletopics master, Hai Xiang, hosted his segment by giving everyday objects for participants to speak about. The first speaker, Piyush, was given a bamboo stick. He spoke about the various uses of bamboo sticks across different cultures and activities. Some interesting examples include the use of bamboo sticks in sports like cricket and hockey while it is used as chopsticks in the Chinese culture. The second speaker, Ri Chen, spoke about brooms. He talked about the different perceptions of brooms in reality in fantasy. In reality, brooms are used to clean while children, on the other hand, tend to associate brooms to fantast and fictional characters such as witches. Following, Yi Xue talked about BBQ pits who he associated to gatherings. She revealed that even though most people may not be aware on how to set up BBQ pits, it is not as important as the time spend with friends. Eric then related balloons to decoration which was used in events that have impacted him greatly. Therefore, balloons reminded him of the joy and warmth he received from his experiences. Lastly, Kingsley explained why bricks are important to building a strong foundation and related its hardiness to determination. He emphasised the importance of having a good foundation in order to achieve greater heights as well as the determination to never give up when times get tough. Using his experience in Toastmasters, he illustrated his point by building on the foundations of speaking skills and never backing down from the fear of public speaking. Moving on to the prepared speech segment, Hai Xiang, introduced to us his passion for theatrical plays in his speech titled “It’s all about me”. He shared that he enjoyed the unfolding of historical events in theatrical plays and places a lot of effort on theatrical production. Finally, he convinced us to share his passion by explaining how props can be used to tickle the imagination of the audience. Next, James questioned whether “We really know Earth” as he explored the mysteries of the oceans. He patiently explained the different parts of the oceans and pondered on how the oceans continue to hide so many intriguing secrets despite Man’s efforts to uncover them. Next, Fannie shared with us some of the common health problems and that victims should never be afraid to seek help and comfort. She hopes that thorough her speech, she will be able to dispel some of the societal prejudices against mental patients. Following, Shi Yi introduced 3 video games that has impacted his life greatly. Each of the 3 games exhibit a highly interesting gaming mechanism which gave him some insights on the personality and thoughts of the game developers. Our fifth speaker, Yong, talked about his journey as a student. Despite the difficulties he faced along the way, he was proud that he managed to enter NUS. Lastly, Ri Chen, completed his Advance Project 4 as he spoke about the influence of Experience and Information Search Styles of Project Risk Identification Performance. Ri Chen started by introducing the need to identify risks in construction projects. Finally, he shared about research that tested whether factors like experience, risk search style and feedback will improve the risk identification performance. In room 14, the table topics master, Wayne, kicked off the night by granting the participants special superpowers. The first speaker was granted the power to control other possessions while Cheng Yi explained why he would prefer using his superpowers for his personal benefits instead of for the public benefit. Wei Jian, our third speaker, was granted his favorite superpower- X-ray vision. He humorously admitted that he would be privileged to see the naked audiences sitting before him as it was not an opportunity presented to most. Our guest, Natellie, revealed that if he were able to read the minds of others, he would use this ability to convince his parents to give him more pocket money as he would be able to know their train of thoughts. Lastly, Sergio shared that if he were able to travel through time, he would want to change history. Nevertheless, he warned us that this ability could end up being a dangerous one as it might alter the history we are so familiar with today. Moving on to the prepared speeches, Rama, the TME introduced the first speaker, Cheng Yi. In Cheng Yu’s speech “Great expectations”, he lamented about the unreasonably high expectations students have about their grades as they blindly chase after academic excellence. He also posed an insightful question for the audience to ponder about: Does good grades actually translate to good knowledge?” Next up, Jia Xu talked about the gap between knowledge and our actions. Jia Xu also warned us to be cautious as our cravings distract and detract us from the pursuit of knowledge. Next, we had Yan Ling, convinced us to “Let IT Go” in her speech as she advised us to let go of the IT products that has become an integral part of our lives. Lastly, Sergio shared an insightful folk tale about a princess. The action was also not missing in room 15, where Bally, the acting president for the room inspired us to treasure our loved ones. The first table topics contestant Bob was asked what he would have done should he be given the opportunity to travel back in time to change something he had done. Interestingly, he revealed that would play more games and join more CCAs. The next speaker, Mark, was given the opportunity to free someone in prision to which he explained why he had no specific person in mind. Hariom was then asked to choose his preference of gender should he be able to change it. He explained why he would still choose to be male due to the outward look of strength. The last speaker was then asked to share a time where his freedom was taken away from him. Moving on we have the prepared speeches. Tony shared his motto in life, “Be shameless” in his entertaining and humorous speech. He revealed that his motto has helped him secure a job and gave him the chance to discover for singing. Next we have Faisal who spoke about the importance of first aid. He gave us a useful abbreviation for us to keep in mind when we want to provide first aid: DR ABC. Next we have Jeffrey who gave a speech on lying with special focus on white lies. Our last speaker, Ken did a project in the advanced manual. He narrated an inspiring and interesting tale of how Billy Elliot, a boy, who went against his father to pursue his dreams of becoming a ballet dancer. His determination and passion win over his father at last. On 17th February 2015, NUS Toastmasters Club celebrated the Year of the Sheep with the special Lunar New Year themed meeting organised by Sergio, Heidi and Nian Deng. Lunar New Year Greetings from the organisers ! In room 3 we have an opening address by our VPE. Nathaddeus Tan. who talked about Ubuntu, the African idea of solidarity encapsulated by the words “I am because we are”. Moving on to the table topics segment, Arun spoke on whether he considers himself a traditional person. Next, Anmol shared the most embarrassing moment in the family gathering. Derek disclosed some of the practices and traditions his family does not follow during Chinese New Year?” and described his love-hate relationship with tradition. Darian shared with us how Chinese New Year has changed him over the years. He described how he had gradually become a more moral person over the years. For the prepared speeches, Wayne Tan Jie Yang attempted his project 1, titled “About a wonderful person”, who turned out to be himself. Ganesh Srinivasan did a speech on the job hunting process and relevant tips. He gave some wonderful advice: “Build a career and don’t just look for a job”.Next we have Jun Han who shared with us “A fish like no other”. Yu Sheng reminds him of his favourite fish, salmon. Koh Yan Ling told us the importance of having good relationships with neighbours. She offered the helpful tip of giving food to neighbour to break the ice. The Best Table Topics speaker was Derek Lau while the best prepared speaker was Wayne Tan. In room 4, we have an opening address by Bally. Next, Shi Jia the table topics master of the evening posed the first question for us. Chun Hui shared some of the superstitions that he practices during Chinese New Year. For instance he explained why he does not cut his hair during this festive period. Following, Jun Hao shared some embarrassing moments during Chinese New Year while Roy talked about some traditions and practices during the Chinese New Year. Next we have the prepared speeches. The first speaker Ai Xin, gave us a Beer 101. She talked about the two different types of beer and differences in taste. Next we have James who shared about his exciting life. The next speaker Wen Xin shared with us her experience on volunteerism. We could feel her compassionate heart and love for others. Lastly, we have Ri Chen who is doing the successful club series. He talk about the various appointment roles, their responsibilities and how do we ace these roles to make the chapter meeting a success. In Room 2, the Toastmaster of the Evening, Ken shared about his family’s Chinese New Year traditions before Acting President Christina Lian deliberated about her family gatherings during Chinese New Year and why she felt that the Club is also a family for her. Next up, the table topics master Zhixin brought in the festive mood with her Chinese New Year themed questions which she had meticulously kept in red packets. The first table-topics speaker was Jia Cheng who shared about how he is anticipating the holidays because he wants rest and recharge during the long weekends. Next, Jackie revealed why he does not subscribe to any superstitions related to this festive. Vignesh then shared that his most memorable experience was getting a $100 red packet and pineapple tarts from his Chinese friend and getting stuck in a traffic jam while travelling to Malaysia over Chinese New Year. Yi Feng, who won the best Table Topics, shared about how Chinese New Year has changed over the years and revealed some tips on how to tackle the typical “conversational starter” questions from our family during gathering. He also encouraged us to think about the questions from a different perspective, by seeing how our family cares about us. Lastly, Nian Deng talked about red, which is also his favorite color because it is an auspicious color. For the prepared speech segment, Pei Ru completed her ice-breaker speech titled “What is a home?” She shared that back in her hometown where she led comfortable life, what she yearned was independence but after she came to study in NUS, she started to miss home and her family. It was indeed a very personal and sincere sharing by Pei Ru. Next, Jia Zheng convinced us to stop the bad practice of not clarifying doubts immediately. because it never hurts to ask for help or clarifications. The third speaker, Vishnu impressed the audience with “The Art of Haggling”. It was certainly a very interesting and useful topic which everyone can benefit from! Some tips she shared include talking to the managers and not to look desperate or over-enthusiastic. Lastly, Gisela, the best prepared speaker, pondered on how birth order affects our personality in her speech “The Achiever, The Adaptable and The Approachable”. Gisela explained why the eldest child tend to be good leaders while the middle child is the peacemaker in the family and why the youngest tend to be more sociable and non-conformist. After the prepared speech segment, it was finally time for the special Chinese New Year themed segment. There was silent evaluations for the prepared speeches. The members certainly had much fun during this special segment which even included a “lao yusheng” segment! Even though the meeting on 3rd February 2015 was held in a different location, the Faculty of Engineering, all the members still came out in full force. In room 6, the SAA Jun Han gathered the room to order. Following that, Andy give an opening address. 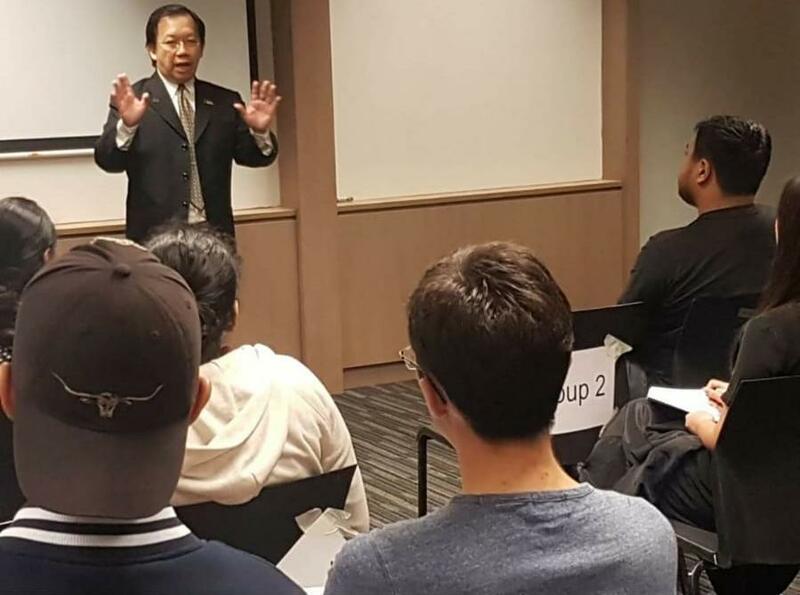 He inspired us to turn strangers into new friends as a Toastmaster by sharing his one on one Starbucks experience by making a friend with a stranger. Moving on, TME of the evening, Yong Kee introduced the Table topic master, Jun Han. The first contender in the table topics segment is Azmall. His question was “if you will be dead in a year time, will you change your lifestyle?”. Azmalm answered that he would like to spend more time making friends. The next challenger is Raymond. His question was “who would you invite for a dinner?” He chose his mother because it is his little way of expressing his love for his mother. Next we have Jun Xin. His question was “which value you see in a friendship.” He told us the ability to make friends with strangers is more important instead of pinpointing a particular defining value when in it comes to making friends. Next we have Gisela. Her topic,”For what in life do you feel most grateful for?” She is grateful for her family and the values she had imparted from her grandfather. Next we have Shi Jia. Her question was “If you could wake up tomorrow having gained any one quality or ability, what would it be?” It is the ability to do what you want. Lastly, we have the infamous Tse Wei. His question was “would you want to be famous?”. He shared that even though triads may be notorious for their actions, they are actively involved in charitable activities. It was certainly a thought-provoking table-topics segment! Moving on to the prepared speeches, Azmall shared his noble dream with us. He believe that there is definitely a way for us as human beings to live longer and stay healthy. He has a vision of entering politics in an attempt to implement health campaigns and propagate his idea. Next we have Jiaxu who came with a title, “Are you hacked today?”. Ge made us deliberate on whether we are so comfortable with the convenience that technology has delivered and neglect the existence of potential threat of hackers. Next we have Hariom who asked us “What do you see?”. He showed us how “I” as an individual is already a part of “we” a group of individuals or organisms. Next we have Yu Juan. Her title, “is life bullying you?”. Sometimes, something negative happens to you, it may actually be a blessing in disguise. She shared her experience where her option to go to her desired university for an exchange was revoked 5 months after their initial acceptance. She was devastated. However, the next option she chose offered her the best experience of her lifetime. Lastly, Jackie ended the prepared speech segment with his emotional speech titled “homecoming”. He shared how he experienced the comfort and warmth of his home after a painful experience. Indeed, we should always be grateful for the home we have, knowing that in moments of anguish, all we have is all we need. Moving on we have a general evaluation by Mi Joo. The best table topics speaker is Tse Wei, best specker of the everning is Jackie and the best evaluator is Daryl. In Room 5, the SAA Wen Xin started meeting enthusiastically with great passion. She encouraged us not dwell on the past, not to dream about the future but to focus on the present. Following, Acting President Bally shared with a personal experience and why he felt that Toastmasters members are windows in a building. The Table Topics master, Jia Zheng gave us a round of impromptu speeches which he felt was essential for everyday conversation topics. Abishek was given the challenge of analysing whether the economy now more volatile than ever before while Kevin deliberated on why even though extensive periods of time and resources have to be spend on campaigning, students are still willing to participate due to the rewards. Wayne was questioned on whether he felt that a bachelor’s degree is sufficient for us to survive today. He reflected that a degree is not the most important thing in our lives and that we need many other elements to make our lives a fulfilling one. Following, Lavanya explained why the gift of the gab is only a gift if well-used. After all, with great power comes with great responsibility. Wen Xin then ended off the segment with her examination of the current state of oil prices and how it depends on the different countries and currencies we are using. For the prepared segment, Najeeb reflected on his time holding a leadership position in the Universities and its hardships. Through his experience, he learnt to appreciate the small things in life and to always have some humility. Next, Minh shared with us how his SMS method helped him to overcome his fear of riding motorbikes. Keerthana then shared that even though financial constraints have impeded most from travelling, we should always try to overcome these constraints because travelling is important. Indeed, life is either a daring adventure or nothing. Following, Andrew persuaded us not to be an impulsive buyer by divulging on the techniques businesses used to encourage the irrational behaviour of impulsive shopping. Lastly, Menglu shared her personal experience with a teacher and why the only thing that matter is what you have done to impact someone’s life. Menglu has certainly motivated the audience to live a life to impact someone else. It was indeed a night where the spectrum of speeches have inspired and encouraged the members! The meeting in PGP Room 3 was kick-started by Christina who spoke about how simple acts of appreciation and encouragements can lift us up. 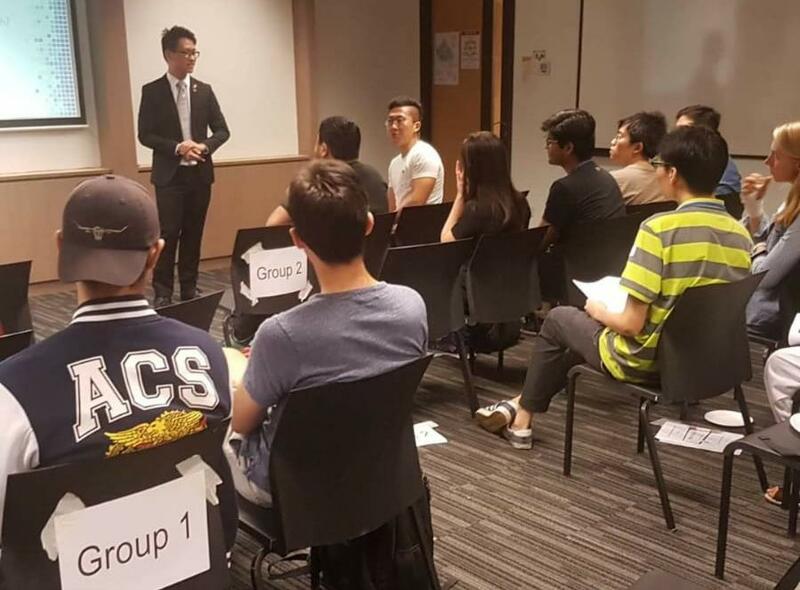 Maintaining such attitude of appreciation helps everyone in NUS Toastmasters greatly when they feel their speech is not up to standard. Tables topics was a mystery as Yong Kee, the table topics master for the evening, started out the segment by role play. He dug out a huge box of treasure and then promptly went to describe how every toastmaster in the room is now an archaeologist. Everything in the box was a surprise, which any archaeologist(volunteer) has to appraise. Wei Ling was the first to come up and she picked tissue paper. Our returning member Ryan, gave a descriptive story about a bottle. It was indeed an unconventional Table Topics segment where Yong Kee successfully liven up the atmosphere while increasing the standards for our impromptu speaking segment. The prepared speeches were next and Ganesh was the first to break the ice. He shared about his background, that everyone in his village used to be called Kariom. Ganesh’s speech was brimming with enthusiasm and energy. The second speech was “say-ed” by Huan Hock in project 4, how to say it. He shared lessons from the movie: 3 Idiots. One of the lessons he shared is to doing things from our heart and to pursue excellence and not success. The third speech was embodied by Jian Ye, in your body speaks. It was a inspiring call to action towards our dreams. Following, our fourth speaker made a grand entrance as she swung onto the stage. Wei Ling let us into the jungle as she took on the persona of Jane. The speeches ended on a solemn note, where Sergio did his AP5 Public Relations manual to speak under fire about the tragic QZ8501 crash. The first evaluation was floored by dashing Derek. He was encouraging and had great posture and helped to give practical feedback for Ganesh’s first speech. Heidi gave a heartfelt evaluation for Huan Hock about his use of hand gestures and that he demonstrated a good use of body language. Ken’s Klassic Konnotations were funny and appropriate for Wei Ling. He also suggested some actions that Wei Ling could do to make her speech more animated. The last evaluation was by Wekie, and he gave suggestions on how Sergio’s reply could be more specific and detailed. In PGP room 5, we had an entertaining SAA for the everning, Darain, who cracked a joke when he commenced the chapter meeting. Our President Hui Juen shared a personal encounter in the MRT cabin where she recognised that we can always polish and practice our skills anywhere. We have an engaging TME tonight, Tse Wei. Moving on to the first segment of the everning, we have Wenxi, the table topics masters hosting the event. Shi Hui was required to tell us a story that involves betting. Faisal was granted a wish. He hoped to have more precious time to be with his family members. Shu Lin told us the rich people deserve to be rich because of the effort they have put in while Hariom described the impression of his dream girl. He shared with us his opinion of his dream girl during his different phrases in life. In the prepared speech, the first speaker, Ivan, shared about “me and leadership”. His key message was to never stop learning, take action and motivate others. Next, we have Faisal. His title is “Old is gold”. He highlighted the invaluable knowledge and inspirations we can tap onto from the elderly. Our third speaker, Fuk Kin, shared with us the power of your voice. He tells us the importance of vocal variety and how it affects our relationship with others. Next, we have Yueh Jia who did her project 10, attitude: self cultivation. She shared why it is important cultivate good manners and how can we do that. Lastly, Jaysree completed her first project on the humorous manual, informed us what drinks should we befriend and which drinks we should stay away. Congrats Shu Lin for being the best evaluator of the night! Tonight the best table topics speaker is Hariom and the best evaluator is Shu Lin. Subsequently, we proceeded to room 4 for the announcements and closing address. It is our second Chapter Meeting of the second semester, on our second day of our second week! Today in Room 4 of YIH, we hold yet another session to improve our speaking, thinking and listening skills. At 7.30pm our SAA Jun Han marked the start of the session with an admin briefing and introduction to Tse Wei, our TME. The chapter meeting was declared officially open by our President, Hui Juen. First up, we had a round of exciting Table Topics by Jaysree. The theme was on how we would spend a certain amount of money on our last day on earth. We had a total of 4 guest speakers out of 5 today. Dheepan, told us how he would spend his 80 cents while exploring Singapore. Najeeb would eventually donate his $1 to charity. Zhi Kai would prefer to spend his last day on earth with his girlfriend. Jia Zheng emphasized that we should do something new and exciting on our last day, while Ryan shared that money was not important on the last day. Instead, he would spend time with his loved ones. Then, we listened to 5 meticulously prepared speeches, first by Tom, who delivered a dazzling speech about a lesson he had learnt: You will never know what you can do until you try it. Next, Fuk Kin achieved his Milestone at P5, with an enlightening speech on rewiring our brains, and that assumptions may not be the reality. He gave us 2 stimulating questions to ponder on: What do you think you know? What do you actually know? 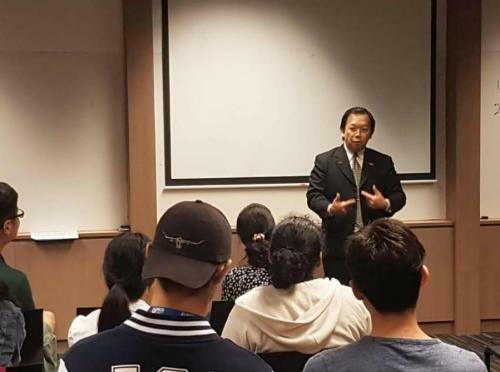 After Fuk Kin, Minh introduced himself to us in a well-delivered P1, in which he shared that he came from Hanoi, Vietnam, his hobbies and his current life as an NUS Student. Lastly, Rama gave his award-winning P9 on Crushing the Can, in which he persuaded us to stop drinking Coca Cola and soft drinks. In YIH Room 3, Vice President (Membership), Christian Lian, welcomed everyone by sharing her story of how a cashier interrupted her before she could finish conveying what she wanted to say. She made the story relevant by telling us how we should listen and show our support for our fellow club members doing their projects. Next, Language Evaluator, Jackie Lin, explained to us the word of the day, “enrapture”, and encouraged us to use it to make our speeches more enrapturing. Moving on to the table topics, Table Topics Masters Koh Yan Ling gave us a theme of Surprises. The first speaker, Suphasak, had the question “How far will you go in money, time, and effort, for a surprise?” Suphasak shared with us his opinion of how he would put in as much money, time, and effort, to surprise someone, if he finds the right girl to impress. Next, we have Faizal, who received the question “What is one surprising fact about yourself, if not, what is one you would like to have?” Faizal shared with us that he was a dancer, and brought us through his journey in his Indian Dance CCA, where he performed as a lead dancer, and also competed in 2 SYFs. Next, speaking about the “Best surprise you have received”, Meng Dan shared with us how she finally learnt to swim after 22 years of not being able to. With this, we concluded the Table Topics segment. Shihan who just completed her ice-breaker speech! After concluding the Table Topics segment, Shihan started the prepared speech segment by speaking about her four years in Tong Ji University studying engineering, and that life lessons she learnt. 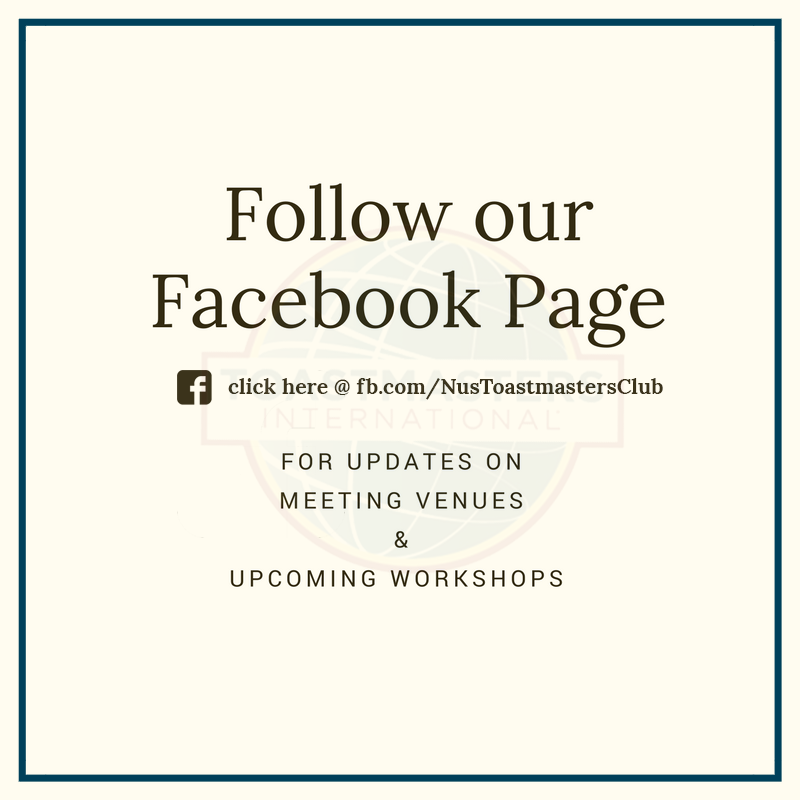 Shihan also shared with us her hobbies, and gave us the reason why she wanted to join toastmasters – to conquer speaking English language and Public Speaking. She then concluded with this: “Life is the process of encountering difficulties and challenging yourself”. All the best, Shihan! Secondly, we have Suphasak, doing his Project 2. Suphasak shared with us his epic adventure in Europe – specifically the adventures he had in Amsterdam, Munich, and Amsterdam. He shared with us the sights and sceneries, the culture and the tradition of the places. Thirdly, we have Roy, who spoke about how he was kidnapped by negative emotions after not doing so well for his examinations. He then gave us some tips on freeing ourselves. The most memorable part of his speech was this: “Every dog has his day, every man has his period. When it comes, let it come. When it goes, let it go”. Fourthly, we have Meng Dan, who also shared with us her experiences in travelling, but this time, to Taiwan. She recounted beautifully the wondrous experiences of her journey, and the kindness of the Taiwanese people, as she shared with us how an old lady picked up her from the side of the road and offered to drive her to another location. And finally, we have Ken, who shared with us his personal, heartwarming and yet heart-wrenching story of his family member, friend, and pet, Lie Ann. Ken shared with us the experiences he had growing up with Lie Ann, and how she sadly passed away last year due to cancer. Ken, our hearts are with you. For his wonderful, touching story, Ken won the best speaker of the evening. 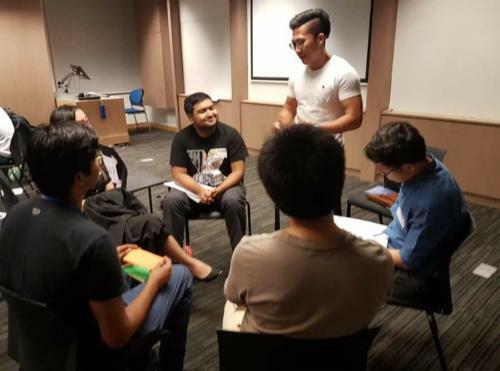 It was indeed a night where fellow NUS Toastmasters managed to learn while having fun! As the year drew to an end, it presented the members a time of reflection. With the various thought provoking table topic questions presented, the last chapter meeting for 2014 was indeed a time for the members to look behind us to move ahead. In room 2, we had Ken who shared with us countdown for the new year in the table topics segment while Jeffrey reasoned why new years are overrated. Srivatsan shared with us where he would like to bring his girlfriend on the day of countdown. Moving on we have the prepared speeches. Wan Wen shared a story of her youthful days. Zhihao talked about some articles he read on the internet. Sindhu shared an unusual experience where her father was an actor in a movie show. Tse Wei talked about how to pokemon your way to success. Wei Jian shared a talk on leadership and how to lead successfully by focusing on the few who change the world with you. For the table topics segment in room 3, John talked about making mistakes while Jackie shared with his most memorable milestone in 2014- the humorous speech contest. Jian Ye shared his most noteworthy news in 2014- Joining the toastmasters speech contest. Yi Yui explained to us why having new year resolution may end up bringing more harm than good. Jue Kun was asked whether he celebrated the International Chinese New Year. Next up, our first prepared speech speaker, Wan Ling shared with us her hobbies, personality and her raveling experiences. Yan Ling reviewed her year. 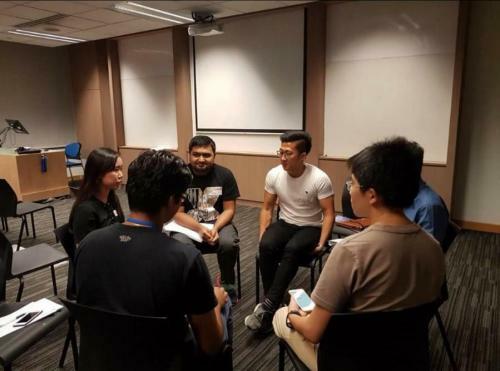 Alyssa shared with us her fears and how she overcame it while Wei Ling gave us some tips on how to be a good evaluator. ln room 4, the table topics master, Lin Hong, initiated the table topics for the evening. Fuk Kin pondered on whether national service should be made compulsory for women. Mengdan reflected on a day she wished she could change in 2014 while Rama wondered what would happen if Santa was actually a Transformer. To end off the session, Debjani was given the opportunity to give an opening address if she were the President of NUS Toastmasters Club. Rama, the best Table Topics speaker and prepared speaker in room 4! Moving on we have the prepared speeches. Roy shared with us a story- the Judoku with only one arm. Debjani confided in us her experiences with chopsticks-nightmare of dancing chopsticks. Rama talked about forming habits. Hui Juen gave us a workshop on how to provide effective feedback. Rama was the best table topics & best speaker of the evening in room 4. It’s finally the much anticipated Christmas-themed meeting and the enthusiasm and warmth of the members has certainly enfolded our hearts. For the extra special chapter meeting, we had a hat-sorting session where we were allocated into different groups before the meeting commenced. Tse Wei led the Table Topics segment in Room 2 with his Christmas-themed topics. Ruoyu was asked what Christmas meant to him while Minh Anh answered the question on how to celebrate Christmas. Jackie deliberated on why we tend to wait until Christmas to give and celebrate while Yi Feng pondered on whether Christmas had been overly commercialised. Moving on to the prepared speech segment, Spandhana gave us tips on how to battle the illusion of not having enough time. Following that, Shi Ting gave her speech on impulsive shopping while Richen invited the members to go Clubbing with him. To wrap up the segment, Nathaddeus Tan, who was the best prepared speaker of the night, contemplated on how joining the Club has ruined his life. Room 3 was assembled by SAA Wan Wen. The TME Ivan began the evening by introducing the appointment holders. Movingly on ,we had our table topics hosted by Fuk Kin. Sharafina encouraged everyone to spend time with our family members during Christmas while Meng Dan shared with us her wish for a Europe trip if Santa were to grant her a present. Vishnu told us even naughty kids should receive Christmas gifts from Santa. Yunus received the question,”what do you do when you receive a present you dislike”. He said it depends on whether he would be able to use the gift. Yunus achieving competent communicator. Congratulations! After which we proceeded to the prepared speeches. Meng Dan informed us how to effectively manage our lives by developing a winning attitude. Sharafina shared with us the skills for socialising. Yunus completed his project 10 by sharing with us his lowest point in life. “When you are at your lowest, you are open to the greatest change”-Aang,Avatar. Lastly, Vanessa enchanted us with Cupid’s romantic love story. For room 4, Roy, the table topics master, asked us about Christmas. Kanash spoke about his most romantic Christmas, where he met his wife Laviya while doing community service. Jiahao shared with us about his favourite Christmas Song – First Noel. Lavinya finished the table topics segment by explaining why chocolate is her favourite holiday snacks. All three of them were first-timers at Toastmasters and we received them warmly. Moving on to the prepared speeches, the first speaker, Jun Han, read us a poem that we would have heard in the movie Interstellar, titled Do Not Go Gentle into that Good Night. He called us to live life such that we would not have regrets when we are done in this world. Next, we had Ai Xin, who shared with us her memorable and fraught-ridden trip to the summit of Mt Fuji, and how it all paid off in the end when she saw the splendid sunrise the following morning. Following that, Jaysree, confided in us her experience with racism since young, and persuaded us to improve so that the future would be brighter. Also, Jaysree’s project marked the tenth speech of her competent communicator manual. Congratulations, Jaysree! Last but not least, Perry informed us about how we can mitigate the threat risks poses to our family with insurance. We wrapped up the session with a prized presentation: the best table topics speaker is Kanash, and the best speaker for the evening is Jaysree. It’s the holidays but NUS Toastmasters Club is still packed with amazing people and exciting speeches! The unparalleled zest and commitment of our members never fail to amaze me! For room 3, we have Roy, the table topics master who offered us the keys to different worlds. Ken tells us how teleportation benefits him if it becomes a reality. Jeffery was given the power to change the world. He chose to have more money in his bank account-getting wealthy instantly. Moving on we proceed to the prepared speeches. The first speaker, Yan Ling, prepared a speech on holiday job hunting for dummies based on her personal encounter. Next up we have relationship expert Calvin who shared with the guys tips to attract the opposite gender. Huan Hock use the famous Newton’s law, F=ma, to illustrate how to defeat the monster “inertia” in our daily lives. Fuk Kin shared that we are all storytellers. What story we tell ourselves will determine the outcome of the story. We have the power to decide the ending of the story. Jeffery talked about the number 23. He shared with us his concerns at age 23 about his life. Tse Wei shared with us a story on awakening the farmer in you. It reminded us to judge less, listen more and get interested in others. Lastly, we have Vanessa. She shared with us a touching story about a little girl. After the break, we continued with the evaluators section. We moved on to the award presentation session. The best table topics speaker is Ken, the best speaker for the evening is Tse Wei and the best evaluator is Annabel. In room 2, the theme of the table topics segment was for the participants to sell items to the audience. Jackie started off the segment by selling the audience a matchbox, while Weijian convinced us to buy a lanyard, Yunus sold us a hair curler, Wei Liang persuaded us to purchase an anatomical model while Sze Zhin convinved us to buy a headgear. Following the entertaining table topics segment, Debjani shared with us how even though Science and Art are often portrayed to be opposites, they can actually produce amazing results when they collaborate. Sindhu then talked about how confidence is important while Ramanathan explained how he wish he can deal with slow walkers and Ernest reflected on why we should appreciate today and not worry too much about the future. Wei Jian ended off the prepared speech segment by convincing us to take the middle ground regarding homosexual marriage. Mdm President wrapped up tonight’s informative and inspiring meeting with her closing address.